So... Just What Is Caries? 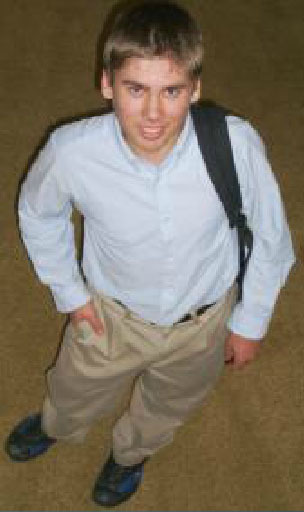 Ben is a typical 17 year old, an outstanding forward on his high school soccer team. He has an active teen lifestyle, a great girl friend, an older brother and lives with his mother. Getting him to floss and skip the Gatorade is just not going to happen. What is happening is tooth decay. Four cavities at his last check up on top of three fillings he had done just six months ago. At this rate he will have a mouthful of root canals and crowns by the time he has his own 17 year old son. 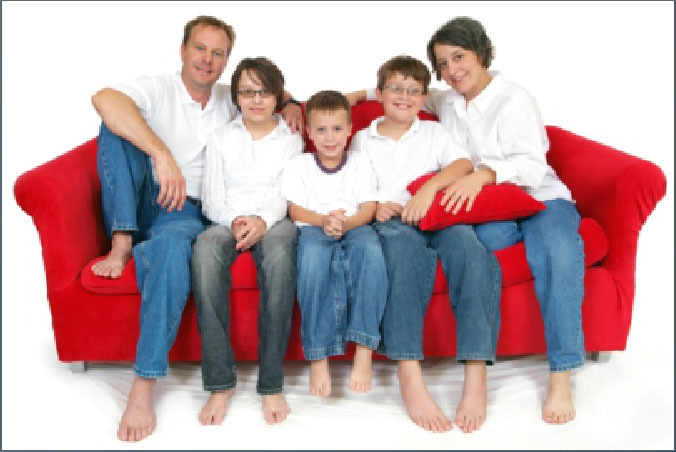 Mark and Kathy both work full time and are busy parents of three young children. Kathy and the kids are usually pretty good about getting to see the dentist every six months and Mark sometimes goes a year and a half between visits due to his heavy travel schedule. It seems like they rarely have a check up where someone in the family doesn't have to come back to get some teeth filled. Kathy needs to have her first crown done on her lower right molar next week and she isn't even thirty five years old yet. There has got to be a better way. Anne is a 57 year old professional who works very hard to stay fit and take good care of herself. She has had her teeth cleaned and checked religiously every six months for years and she brushes and flosses meticulously every day at home. Lately her mouth has been feeling dry. Six months ago, her dentist told her that there were a few "suspicious" areas on her x-rays they would need to keep an eye on. Yesterday she was told she had two cavities on her upper molars and she would need to come back to have fillings. Anne is devastated and frustrated. She is doing everything right and still gets decay? Risk factors for decay can change over time and someone who has never had a decay problem can suddenly start to have cavities. Caries is an infectious bacterial disease. Left untreated caries will eventually cause the demineralization of tooth enamel and a cavity will form. The following analogy with pictures may help to clarify this point. 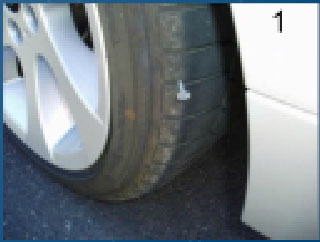 The nail in the tire represents a cavity in your tooth. Typically the dentist will remove the decay (nail) and fill the hole. This treats the symptoms but not the cause. 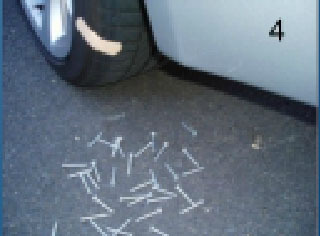 If you have more nails in your driveway (a caries infection) then you are at risk to get another nail in your tire (more cavities). 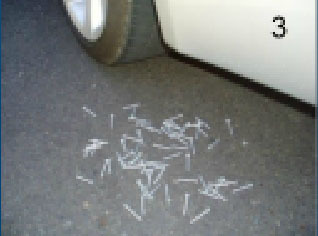 A lot of nails in the driveway represents a patient with a high risk for decay. It seems like every time you come in for a dental visit you are told there is another cavity or cavities. Fixing the tooth does not address the disease. 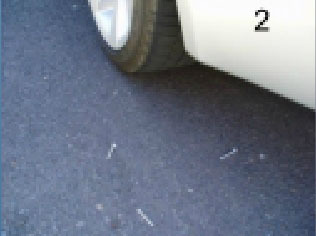 We must treat the disease and get rid of the nails in the driveway for the continual decay problem to stop. Tooth decay is mainly caused by a bacterial infection on the teeth. The CariFree system allows dentists to test for and treat the bacterial infection before it causes tooth decay. The CariFree system gives you and your dentist the ability to take control of your oral health. CariFree employs advanced infection testing and treatment technology to promote long term dental health, instead of simply treating symptoms by filling cavities. How is it possible? The advanced CariFree system measures the magnitude of harmful bacteria on your teeth. If harmful decay-causing bacteria are identified, the CariFree treatment plan may be prescribed by your dentist. Good oral hygiene may not stop activities. Even if you brush, floss, and visit your dentist regularly, harmful levels of the decay-causing bacteria may still be present. CariScreen: an easy 1 minute test. 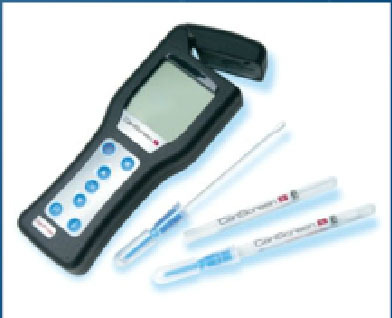 The quick and easy CariScreen test determines your level of decay-causing bacteria. It takes only one minute to determine if you are at a low, moderate or high risk of developing cavities in the future. 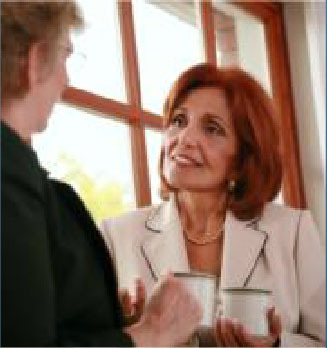 Since risk facts change over time, it is recommended that you take the CariScreen test once per year. Treatment consist of using a series of CariFree antibacterial mouth rinses to reduce the bacterial levels on your teeth, giving you a better chance of avoiding future dental decay. It's that simple. There are two types of rinses: CariFree Treatment Rinse - A two-part treatment rinse that kills the harmful destructive bacteria on your teeth. It has elevated pH that is designed to offset the acidic condition of the infection. 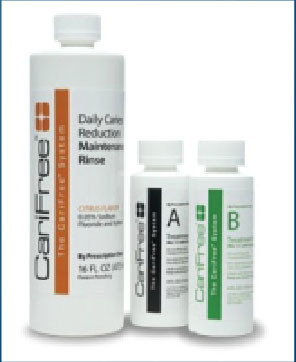 CariFree Maintenance Rinse - Designed to create an environment in your mouth which prevents the destructive bacteria from re-establishing itself. It also has an elevated pH which promotes a healthy oral environment. Think of caries as a lawn overrun with weeds. Mowing and watering the lawn (brushing and flossing) will not get rid of the weeds. A weed killer (treatment rinse) is needed to get rid of the weeds (disease) and then fertilizer (maintenance rinse) is needed on a regular basis to maintain a healthy lawn (mouth). 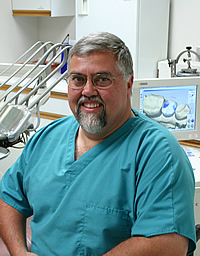 Dr. Beadling is a member of the World Congress of Minimally Invasive Dentistry and he is taking advantage of this new information to bring his patients a better kind of dentistry. Minimally Invasive Dentistry aims to empower patients (through information, skills and motivation) to be in charge of their own oral health, so that they only require minimum intervention from the dental profession. The result for the patient is healthier teeth and gums with far less time sitting in a dental chair and at a greatly reduced cost of treatment. Please call our office today to find out more about this exciting and practical approach to dentistry. Minimally Invasive Dentistry is respecting the health, function and aesthetics of oral tissue by preventing disease from occurring or intercepting its progress with minimal tissue loss. With newer technology and recent scientific advances, progressive dentists can begin to transition away from the typical surgical model of practicing dentistry (drill and fill) to more of a medical model where diagnosis, early detection, and prevention is stressed.